If you are looking for an unusual Halloween or spooky book, this is a winner. We rad it year round. This book works well as a small, self-contained folktale about beating a powerful group of foes by using one's head. While the apparent death of the witches is a little disturbing, considering the rabbi and his friends "Dorothy"-ed them, it's also a little hilarious as well. I snickered, at any rate. The illustrations are an unusual mix of black and grey. No other colors are present, which gives the images an antique feel. More remarkably, the individual cartoon faces of the characters are very well drawn. Considering some of these have sixty or more individuals in a single scene, that's a fairly daunting task. The only thing really missing in this is some additional notes. The dust jacket does reference that the story is originally from the Talmud, but I would have liked some more backstory on that. On the whole, it worked together pretty well and presented a positive portrayal of a Jewish village working together. This was an interesting Jewish folk tale that is perfect for those in the Halloween spirit (though it is NOT a Halloween book). I had an idea where the book was going but I wasn't sure. It was an interesting plan the Rabbi came up with. I like the concept that witches only come out on full moons and scare the villages. But they won't come out on full moons when it rains. Therefore, if 29 men went to the witches caves when it rains, and were dry, well that would be some trick. The witches wanted to know how the men could walk between the rain drops and not get wet. So the Rabbi and the men lured the witches in the rain to dance...and you can guess the rest...a whole Wizard of OZ "I'm Melting, MELTING M-E-L-T-I-N-G"Why this book did not get 4 stars from me is he picture are very monochromatic and a little dull. Not my taste. But I liked the story! There was a small villige bothered by a family of 29 witches. These withces would only come out during a gull moon so no one in the villige ever saw a full moon. Finally one night the Rabbi took care of the witches and they were gone forever, and all the people loved the full moon.For a book that was mad such long ago the illustrations are not to bad. They did a good job knowing pictures help the rader. Almost every picture fills the pages and go of the page. They made sure to use every once of white. Also the illustrations fit the reading well and you get a good visual picture of what is going on. The book had very good text and morals. The art was understandable but I thought illustrator could have done a better job with the details of the witches. They did not look as unfriendly as the texts stated. This is also one of those books you pick up but put right back because of the cover. It was really dull and old. After opening the book though it began to get more interesting. Even though this is an older book it can still be read by children today and they can relate. The author gave a brief description of her life on the front page to help me understand where she is coming from. What to do when Halloween is a Friday night and your synagogue has services? Read the Rabbi and the 29 Witches, a delightful Talmudic story cast as a children's tale. A favorite of my mother and my daughter. A perfect companion to Maggie Anton's Rav Hisda's Daughter, where she tells the tale too. A just for fun I made 29 Witches Hat Cookies, (a chocolate shortbread cookie with a hershey's kiss) so we could have the Rabbi and the 29 Witches. this was a childhood favorite of mine and i still reference "dancing between the raindrops." when i made that reference today to a friend, all i could remember was that it was from some old children's book that i'd read, so i had to google it to remember what the context was exactly. fun blast from the past. 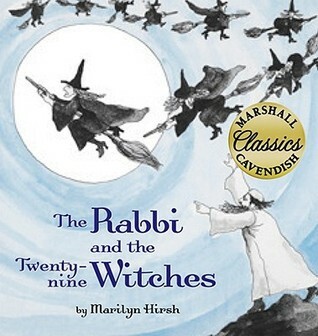 Hear comments about The Rabbi and the 29 Witches from editor Margery Cuyler and from a librarian and students who picked this title for their own in-house book award! Listen to The Book of Life podcast's October 2007 episode at www.bookoflifepodcast.com! I love this book! It was read to me when I was a child, and now I have read it to my older child, who also loves it. One of those books that sticks with you. This is a childhood favorite of mine. I still think about dancing between the raindrops. One of my favorite books from childhood...and now I can share it with William. Very magical! poor witches got picked on. One of my all-time favourite books. Every time it rains, I cannot help but think of the witches trying to dance between the raindrops. Do all witches melt a la Wizard of Oz?Ok to read once. The pictures are nothing to speak of but I love this story. One of my favorite lines about the witches: "They pulled the tails of their cats and bit each other out of sheer nastiness." The classic community based problem solver.